Franny’s supposed to be working this summer, not flirting. But you can’t blame her when guys like Alex and Harry are around. . . .
Franny Pearson never dreamed she’d be attending the prestigious Mansfield Summer Theater Program. And she’s not, exactly. She’s working for her aunt, the resident costume designer. But sewing her fingers to the bone does give her an opportunity to spend time with her crush, Alex Braverman. If only he were as taken with the girl hemming his trousers as he is with his new leading lady. When Harry Cartwright, a notorious flirt, shows more than a friendly interest in Franny, she figures it can’t hurt to have a little fun. But as their breezy romance grows more complicated, can Franny keep pretending that Harry is just a carefree fling? And why is Alex suddenly giving her those deep, meaningful looks? In this charming tale of mixed messages and romantic near-misses, one thing is clear: Flirting might be more trouble than Franny ever expected. Franny is going to spend her summer working instead of acting in the theater program. When she discovers a friend from home and finds out that her brother, Alex, is there as well. The same brother Franny has had a crush on forever. This is a sign she should take advantage of being there and allowed to spend meals and breaks with the others. She gets to know everyone there including the gorgeous Harry. Harry is the kind of guy who knows how irresistible he is and flirts with anyone in range. Franny isn’t going to take a guy like that seriously but before long allows herself to be talked into a date with Harry. She finds herself enjoying it more than she thought she would, even though she doesn’t believe he treat it as a serious date. Life gets more complicated for Franny when Harry seems to be taking things more seriously than she is and Alex starts to flirt with her. What’s a girl to do when she suddenly has two attractive guys after her? Especially when the one she really wants is taken and won’t make a choice? I had a hard time getting into this one. I like Franny, but I didn’t really connect with her. The reason she had for her crush starting was cute, but I didn’t really see why she’d stay interested for so long. Alex didn’t seem like such a great catch to me, even through her adoring eyes. I did like Harry though. He acted like he’s God’s Gift but something about him made him seem like someone I’d like to know. I’m sure I’d have been more like Franny and not taken him seriously, but he was probably one of my favorite parts of this book. Seeing the romances build around Franny was adorable and cringe=worthy all at once. She made so many clear mistakes and misread so many situations, yet in the way of books we can be happy to know that it all works out for the best for Franny. 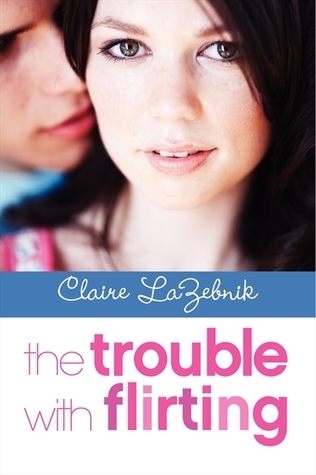 If you’d enjoy watching a girl who has never flirted learn the fun and the trouble with flirting, then you’ll want to read this one.